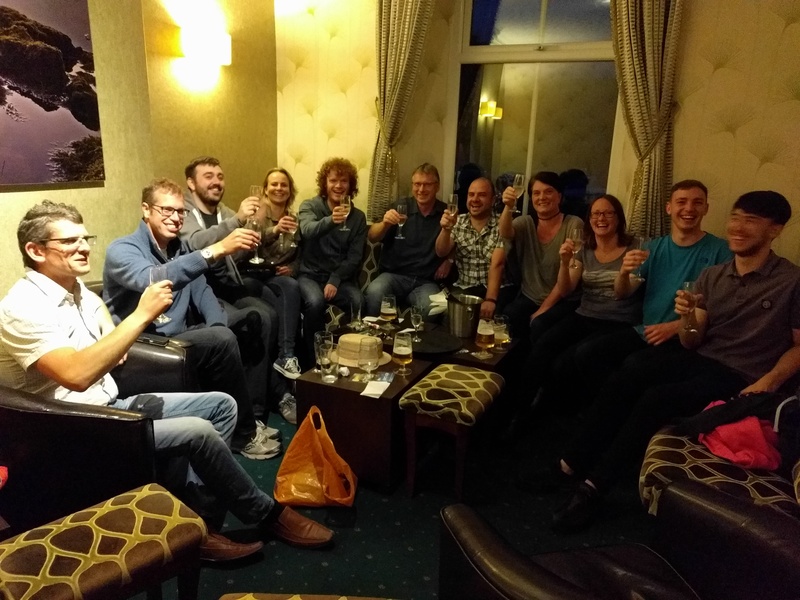 We thought you’d like to hear that last weekend, after much training and preparation, we undertook our fourth Charity challenge. It was without doubt our hardest yet and, with a number of first timers to our challenges, it was all too easy to under-estimate the task. 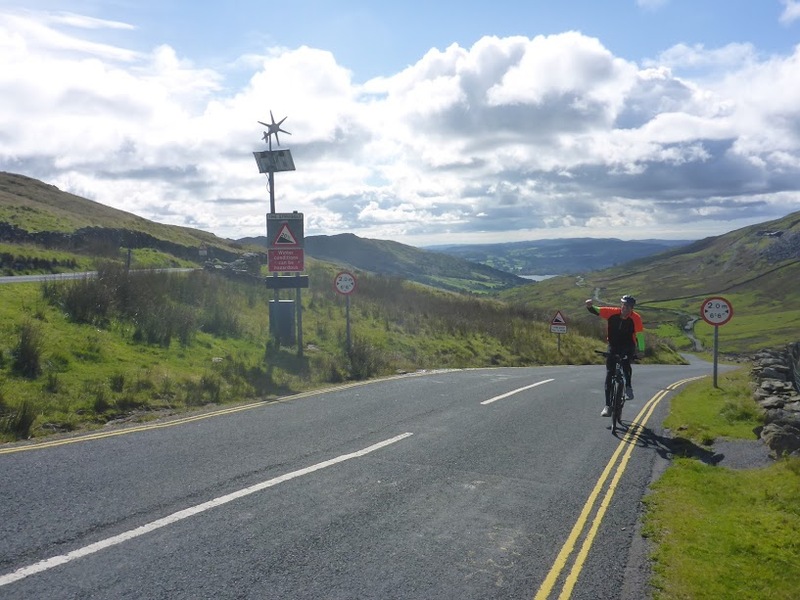 Arriving Friday afternoon, we all took a bit of a detour to get our first view of the infamous Struggle, being the section most of us considered to be the guts of the challenge; a 4.8km climb with gradients up to 20% and notorious in the cycling hill climbing world. We are, after all only accountants, and we left feeling a little shell shocked except Dean and Chris who had inadvertently looked at only 1/3 of the climb and were in ignorant bliss. Following a briefing with the Challenge organisers and prepping the boats, we tried to get a reasonably early night as alarms were set for 5am. 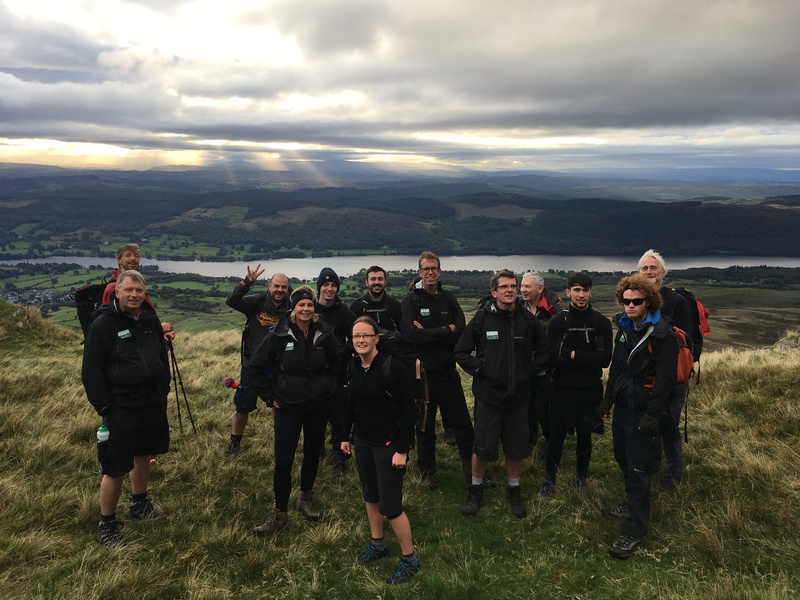 Fortunately the weather was on our side after strong winds and rain all week and we were blessed with fantastic views over Coniston, Morecambe and surrounding fells to help us on the climb up Old Man of Coniston. Those with Fitbits recorded that our daily 10,000 steps were achieved before 9am! Despite 2 fallers and a save by Dean we arrived at the bottom in good time and in relatively good shape and good spirits. We set off on the first cycling section but were only 5 minutes in, when, on a steep descent Josh’s brakes completely failed, he sped past utterly out of control and hit a gate. 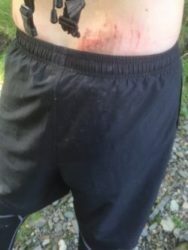 As 20 year olds do he almost bounced back up saying he was fine but he had suffered significant gravel grazes, a smashed helmet and a buckled bike. A complete leveller for us all. 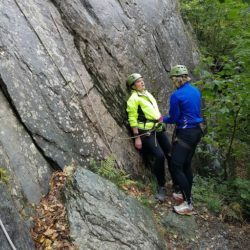 Some reorganisation followed as he was determined to continue, and with Josh riding the guide’s bike we headed for Hodge Close Quarry and the 120ft abseil. Another casualty at the first hill as Craig pulled his thigh muscles and was unable to continue with the cycle. It was a long push up the hill for him, gallantly supported by Steve to meet the rest of us. Abseiling followed and Anita and Matt in particular had to really steel themselves to complete this element and full credit to them. After some refuelling we were back on the bikes, the initial cycle to Ambleside was very pleasant but it just didn’t last. Turning right in Ambleside we hit the infamous Struggle in an instant, and with some frantic gear changes we dug in. What a slog! 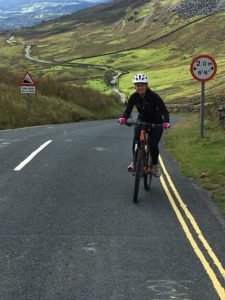 It wasn’t noticeably windy but when in sight of some flat and downhill stretches it was most soul destroying to find that you still needed to pedal downhill into the wind. Jared arrived at the top first, jubilant and relieved. In various states of distress the rest of us followed and it took some time to recover at the top. The pub marking the top was very tempting. 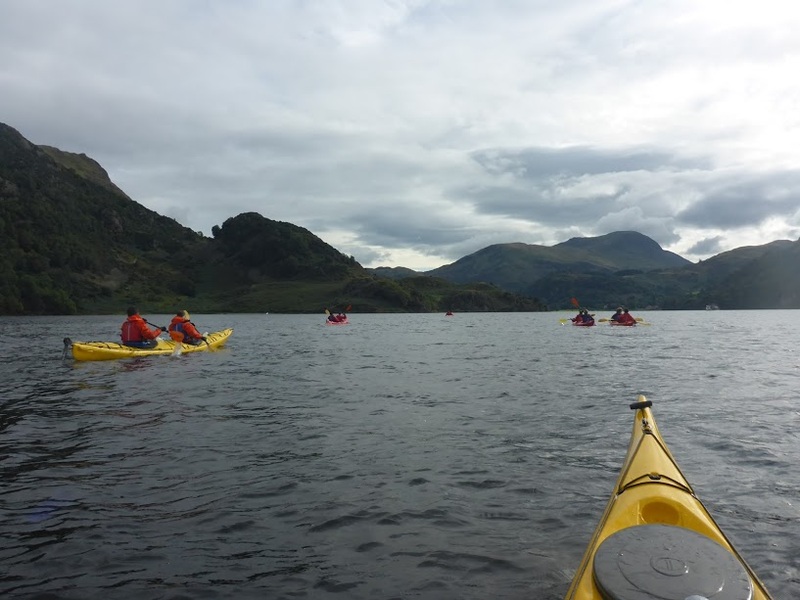 Following Josh’s crash we took our time on the long descent to Ullswater where the canoes were waiting. We had been warned that due to the exceptionally cold water temperatures for the time of year, the cliff jump may be called off depending on how we were coping. I’m not sure if we were pleased or disappointed when we were told it was on. 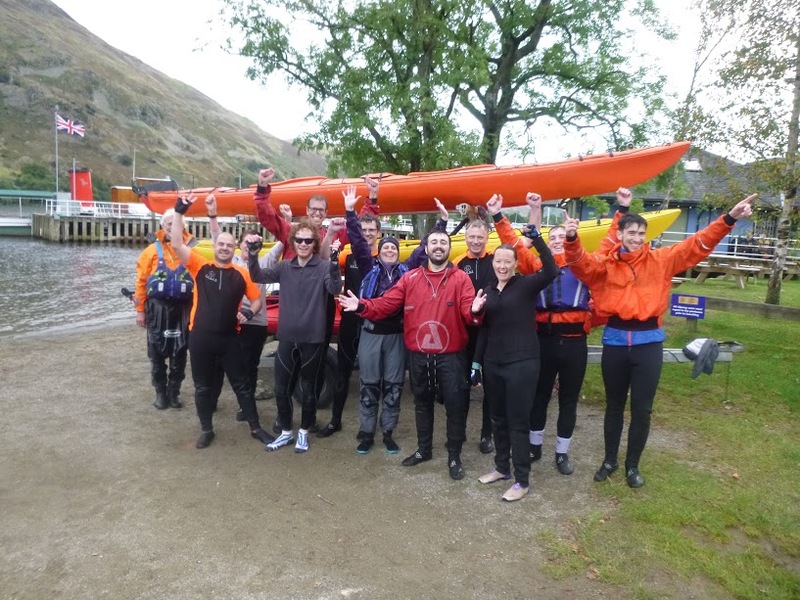 A rather undignified change into wet suits in the carpark followed and we embarked on the long canoe round Ullswater. Steering with your feet was a challenge in itself and I’m sure we completed more miles than necessary as we snaked across the lake. 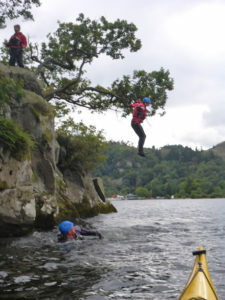 Fortunately, the cliff jump was near the end, and again, some steely determination was required from some as they fought fear of water and heights. It seems some people tackle fear in complete silence and some shout very loudly! And then we were finished, just 10 hours and well ahead of schedule, very tired, very elated and very proud of our achievements.